Customize your iPhone even further thanks to the new tweak, Springtomize 2. It has so many settings packed into just one tiny application. Springtomize allows you to customize your SpringBoard, to make it look and feel how you want. It provides plenty of options to modify even the littlest aspect of your device. Springtomize is really the only tweak you need to customize your device, and it provides all the settings you may need in a single, convenient interface. Here you’ll have a few options including settings for the color, sound, duration and direction of each animation when switching between screens on your iPhone. If you choose the TV animation, for example, you’ll see an effect of an old-fashioned tube box powering off when turning off your iPhone’s screen. The Capabilities panel allows you to deactivate some of your iPhone’s features that you may find not particularly useful. You can deactivate one or several such as Voice Control or Multitasking, by simply toggling the switch to off. 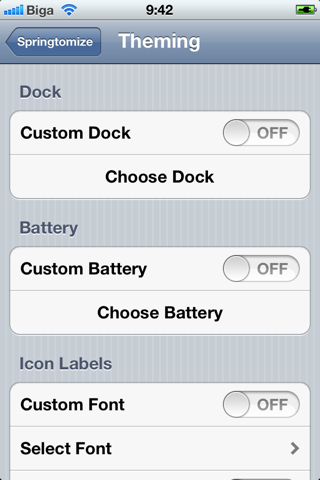 Here you’ll find a few options to modify the Dock on your iPhone. Your options include activating a Cover Flow effect, removing the reflection or to even hide the Dock altogether. This panel greets you with quite a few options to disable or enable default settings on your lockscreen such as the camera or cover art. If you’d like to change the standard ‘slide to unlock’ text to something else, you can do this here as well. The Icons panel offers tons of customized options. It allows you to change the size, labels and icons per line. You can remove those pesky little badges or even disable moving or uninstalling apps. Yes, you can even modify how folders behave by disabling the preview box, hiding the label or choosing how many icons to display per line in the folder window. There are many more options available including setting panels for the App Switcher, Status Bar, Pages and Themes. You can download Springtomize 2 from the Big Boss repo.